We are very excited to share our November exhibitions with you! 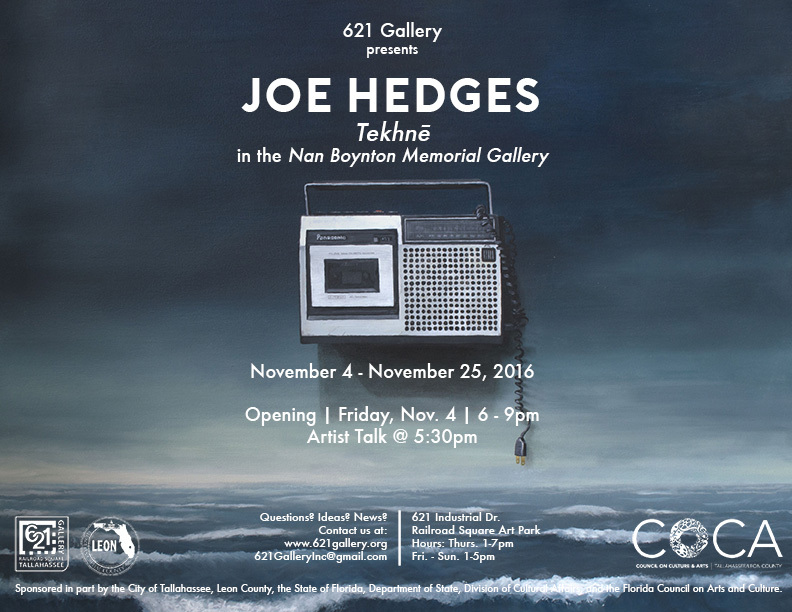 Maggie Evans and Joe Hedges will be giving artist talks this Friday, November 4 starting at 5:30pm during our opening reception. Tekhnē is a Greek word meaning skill. The evolution of the word technology from “systematic treatment of an art” to “the use of science in industry…to invent useful things or to solve problems” (Merriam-Webster) parallels the industrial revolution’s celebration of processes of creation and replication that were divorced from direct human contact. Using various technologies to create new media works and oil paintings, Joe Hedges explores ideas about media technology and replication. The tradition of painting has long been preoccupied with ideas about reality. From mystical cave paintings to contemporary views of art history and abstraction, humans have intermittently embraced and rejected verisimilitude as evil trick or noble goal. Today, our engagement with ideas of truth and image-making owes a debt to French critical theorist and grad-school seminar favorite Jean Baudrillard. Baudrillard’s ideas about simulacra foreshadowed the internet, today a place where the simulacrum is not only a copy of the real but indeed becomes real itself. Hedges’ works engage these ideas through references to disparate sources from art history. In Clear Ideas, surrealist Rene Magritte’s painting of the same moniker is reinterpreted to include a trompe l’oeil 1980’s stereo. In Monogrammatic, Hedges utilizes the sounds and kinetic movement of parts within a copy machine to create a digital video that is then projected onto the copy machine itself, blurring the distinction between tool and product. At the same time, Monogrammatic alludes to a “combine” – a work that combines painting and sculpture – by Robert Rauschenberg entitled Monogram (1955-1959). In Tekhnē, Hedges combines the media of our day: the physical and digital. With the advent of the internet, physical replication (generalized copies of an original) began to give way to the possibility of digital duplication (exact copies). As the long predicted “internet of things” begins to materialize, we are forced again to reconsider the ways objects and art interface with reality. Hedges works at Washington State University coordinating the painting program as Assistant Professor of Painting/Intermedia. Hedges holds a BFA with an emphasis in painting from Northern Kentucky University and an MFA from the University of Cincinnati’s DAAP– College of Design, Architecture, Art & Planning. As humans we often emphasize our uniqueness and individuality. Beneath these independent identities, however, all humans harbor a deep, intrinsic need to be part of a group. A group provides security and comfort, but it also has the potential to override individual thought through manipulative leadership and mob mentality. Using hundreds of uniform chairs I create drawings and site-specific installations that examine human hierarchical systems, resulting social divisions, and the displaced groups that form outside the official boundaries of society. Evans received her BFA in Illustration from Utah State University in 2003 and received an MFA in Painting from the Savannah College of Art and Design in 2008. Evans is currently based in Savannah, GA. Her work has been included in over fifty national and international juried exhibitions and she has had over ten solo exhibitions. Artist residencies include a full fellowship to the Vermont Studio Center as well as stays at the Hambidge Center for the Arts in Georgia and Central Trak in Dallas, Texas. In 2011 she was awarded a Chinese Government Scholarship that granted her ten months to develop new work at the China Academy of Art in Hangzhou, China. 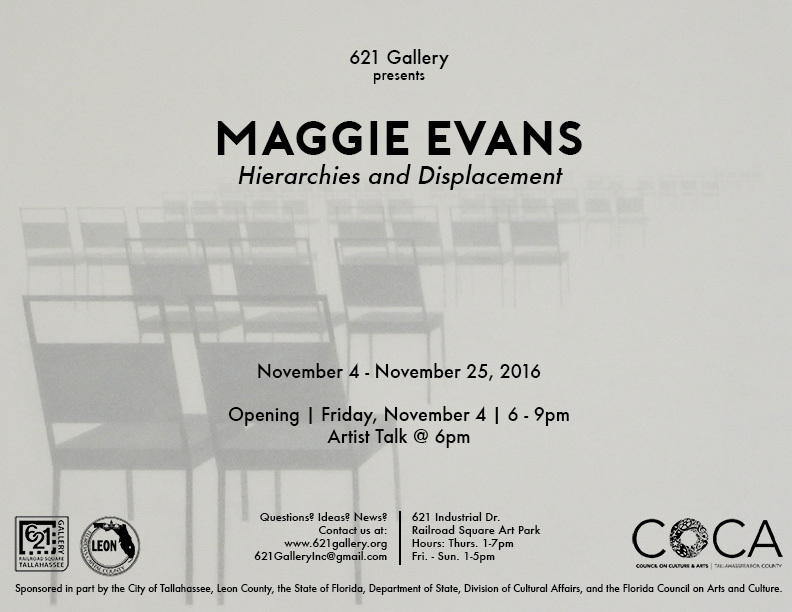 Maggie has been invited to exhibit and lecture at a number of institutions including Indiana-Purdue University and the SCAD Museum of Art in Savannah, Georgia. In addition to her work as an artist, Maggie is a part-time Professor of Foundation Studies at the Savannah College of Art and Design in Savannah, Georgia. She also performs regularly as a professional jazz singer and bassist and recently released a new album with her husband and jazz guitarist, Jackson Evans.